At RaceDeck, we know what it means to really love cool cars and bikes, because we do too. After all, how many other companies can say their CEO has cruised across the Bonneville Salt Flats at 200 miles per hour in a ‘32 highboy roadster? We’re proud of our 100% American-made products and we know you will be too. 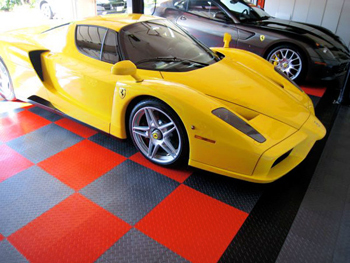 We invented the modern modular garage flooring industry. Our experience is unmatched and comes through in everything we make - no one has been in the business longer, and no one makes as much flooring as us. In fact, we manufacture more flooring each year than all of our competitors combined. RaceDeck offers flooring for all your needs. Classic designs like the Diamond and CircleTrac showcase your space in timeless style, while cutting edge products, like the REVolution, TuffShield, and Free-Flow create custom high-tech looks. Our floors will save you time and energy. They will make your space more comfortable, and above all, make it your own. We can even incorporate custom colors, logos, and designs. With RaceDeck, your options are literally limitless. RaceDeck products are proudly made in the USA. We engineer, manufacture, and ship everything from our headquarters in Salt Lake City, Utah. Snap Lock Industries, RaceDecks' parent company, has been awarded ISO 9001:2008 Certification for its Quality Management System, demonstrating its uncompromising commitment to manufacturing and providing the highest quality products and services to its customers. We consistently improve and innovate, and our 100,000 square foot, environmentally-friendly, manufacturing facility runs 24 hours a day, seven days a week, 365 days a year. We employ over 130 team members and have a distribution network of over 400 dealers, resellers, and distributors. Racedeck floors have been featured on This Old House, Extreme Makeover: Home Edition, SPEED, ESPN 2, The Discovery Channel, My Classic Car and many others. 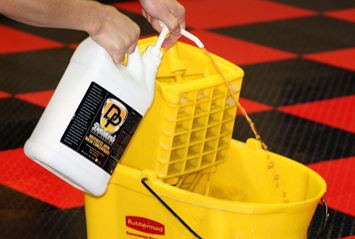 When people want clean and cool custom flooring, they turn to RaceDeck. 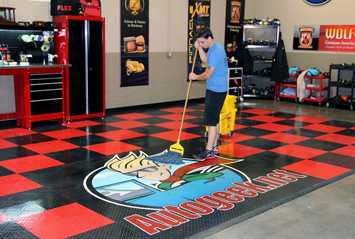 RaceDeck Garage Flooring is easy to clean! The Autogeek Show Car Garage rarely goes more than a day without having some type of cool car being detailed, so we had to come up with a creative way to keep the floor clean. After testing out a couple products, we discovered that a few ounces of McKee's 37 Waterless Wash On The Go Concentrate mixed in a mop bucket containing 3-4 gallons of water removes foot prints, compound residue, and tire dressings without making the floor slippery. Another option is the ready-to-use McKee's 37 Waterless Wash On The Go. Simply spray McKee's 37 Waterless Wash On The Go directly onto the flooring and wipe clean with a microfiber towel or microfiber mop pad. 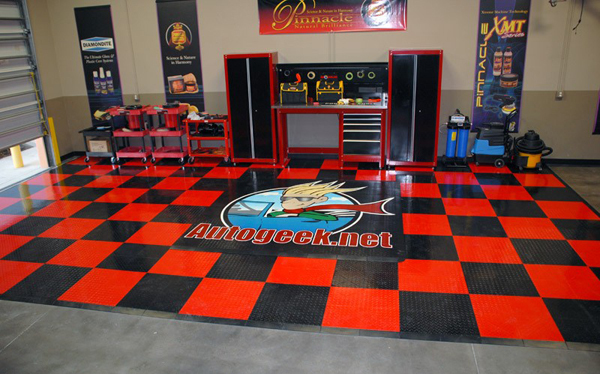 Whichever method you prefer, your RaceDeck Garage Flooring will never look so good!